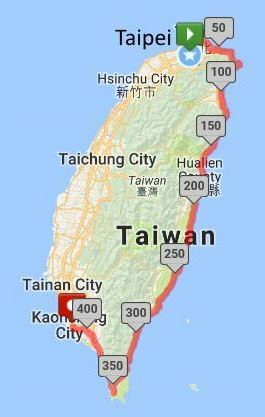 Here's some quick information on cycle-touring in Taiwan, based on my experiences of cycling the country's End to End in January 2017. I rode it with my pal Tim, whose insights are well worth reading too, on his blog unraveltravel.org. 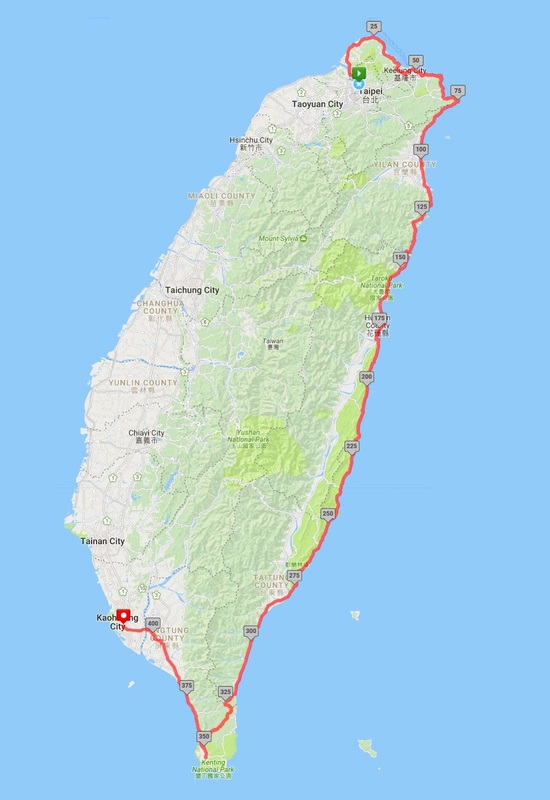 Also worth reading is this article on cycling the East Coast by Taiwan-based writer Steven Crook, who helped us in Tainan. Road conditions Very good. 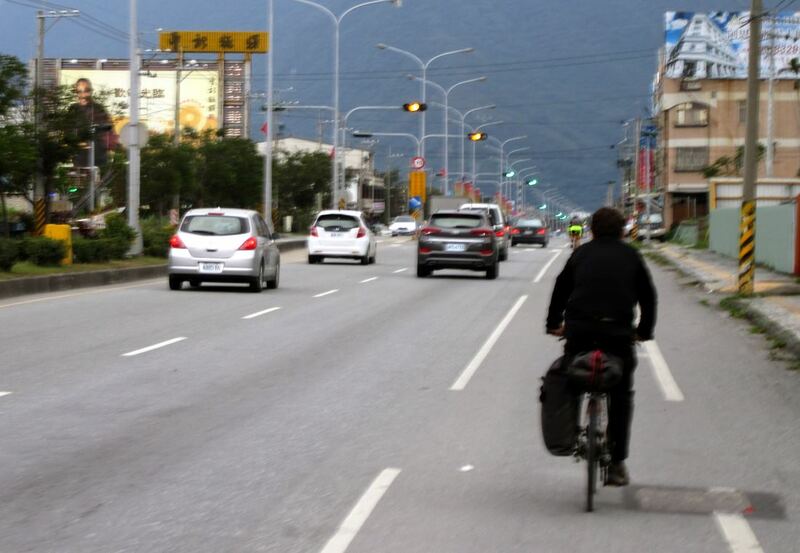 Main roads have wide shoulders (pic) for bikes (and scooters), and there are many cycle paths in the cities. (You can also cycle on pavements anywhere.) Surfaces are smooth and pothole-free. Coast roads are mostly flat. Where there are climbs and descents, they're evenly graded, never very steep (just long!). Drivers are never aggressive. Which bike? Fast Audax-style tourers will particularly love Taiwan, but it's well suited to any sort of bike. It's best to bring your own, but the bike store chain Giant (pic) rents out touring bikes inexpensively (NTD150–NTD200 per day) and your pickup and dropoff store can be different. 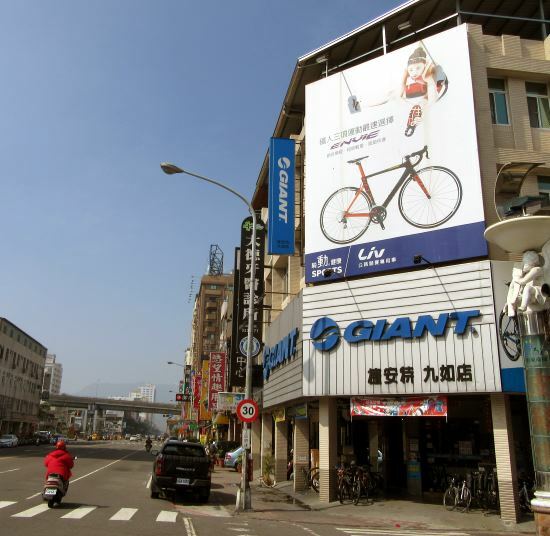 More details on the Giant scheme are at the blog taiwanincycles.blogspot.tw. My rental experience I rented the above bike (pic) from a store in central Taipei and returned it to Kaohsiung for £100 for 15 days. It's a Giant Fastroad CoMax, a very nice carbon-frame flat-bar fast tourer. Disc brakes, click shift gears, narrow tyres (17x622 rims). 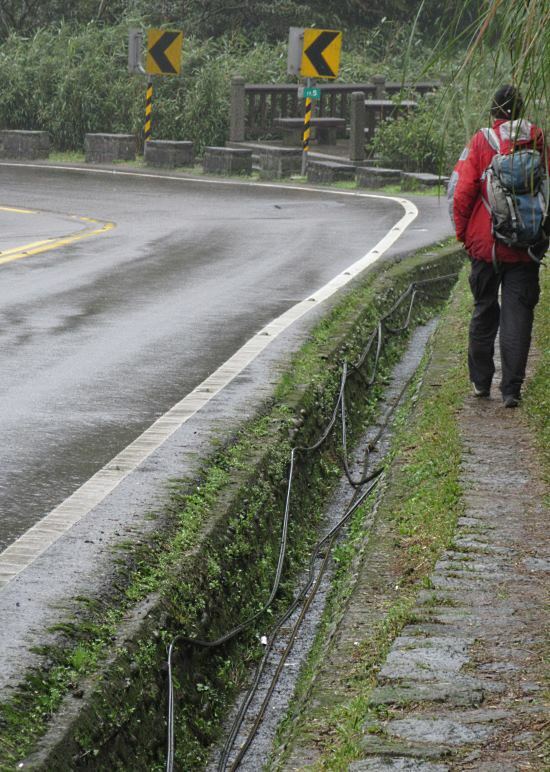 Kickstand, which was great, but no mudguards, which was a problem – it rains a lot in Taiwan. Gearing was 50/34 front and 11-32 rear (Shimano 105), which was enough. 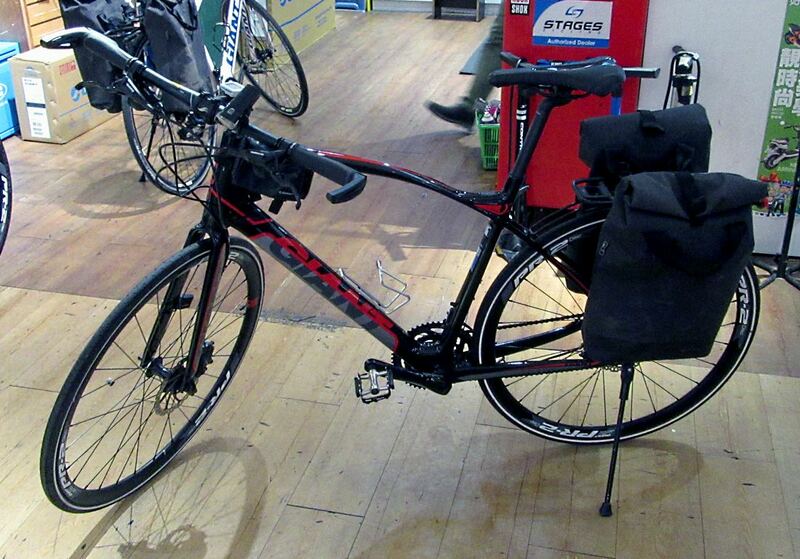 You're supposed to use the Giant panniers supplied, but they're terrible! 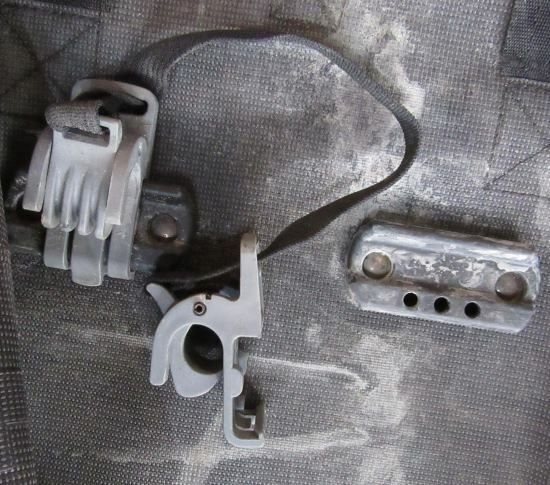 We had problems with all four of our panniers: the clips (pic) that hang them on the rack slide off, so the panniers keep falling off. Eventually the clips break, making the panniers unusable. Use your own – or bring bungees. Trains In theory you can take bikes on trains; in practice it depends on route and timetable. You can take bikes, walk-up, on to local trains only (pic). (You have to pay, but train tickets are cheap). Taking bikes on expresses is possible but involves booking them a day in advance. In practice you have to turn up at the station and ask when the next local train is. See Taiwan Railway's complicated bike policy and additional info from Taiwan in Cycles blog's page. 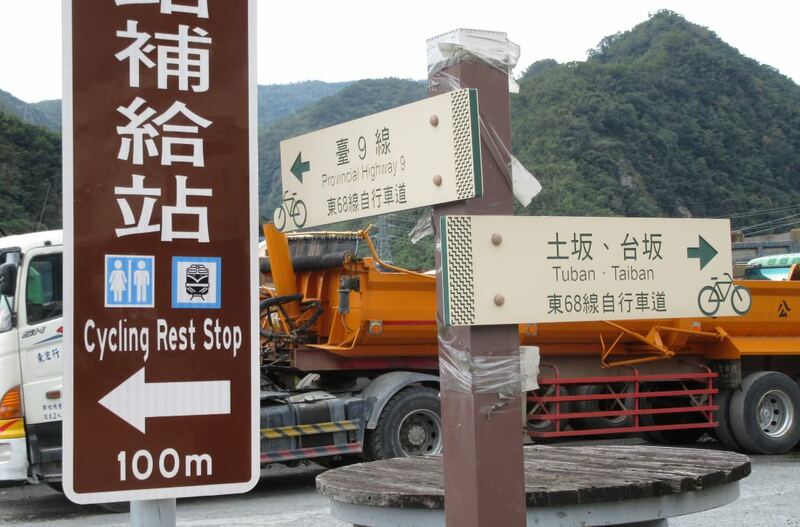 Roadside services Many roads have signposted 'cycle rest stops' every few kilometres (pic). Typically this is a police station, where they'll have a track pump, basic tools, lube spray and water. Towns and cities will have bike shops. Toilets are plentiful and free (and sometimes Asian squat-style). Food and drink Plenty of cheap, tasty street food. Night markets are a delight. 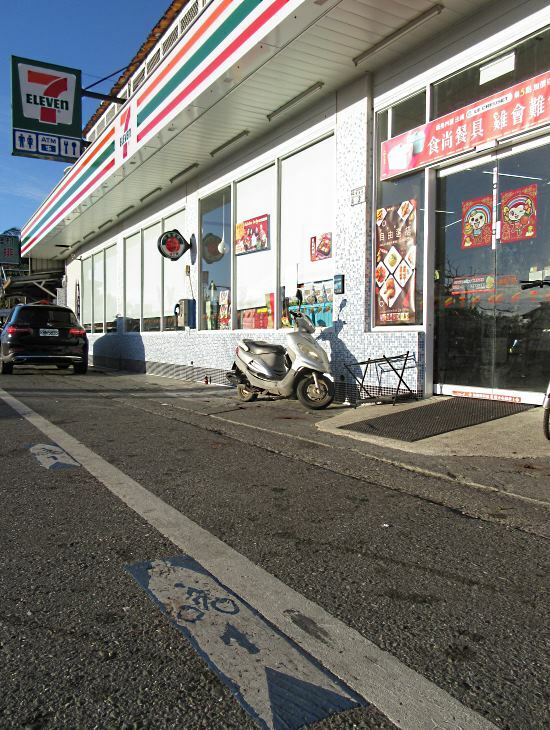 Lots of convenience stores: branches of 7 Eleven (and to a lesser extent Family Mart) are in every town and city, and many villages (pic). They have basic cafes, ATMs, toilets, drinks and snacks. Accommodation Plenty. 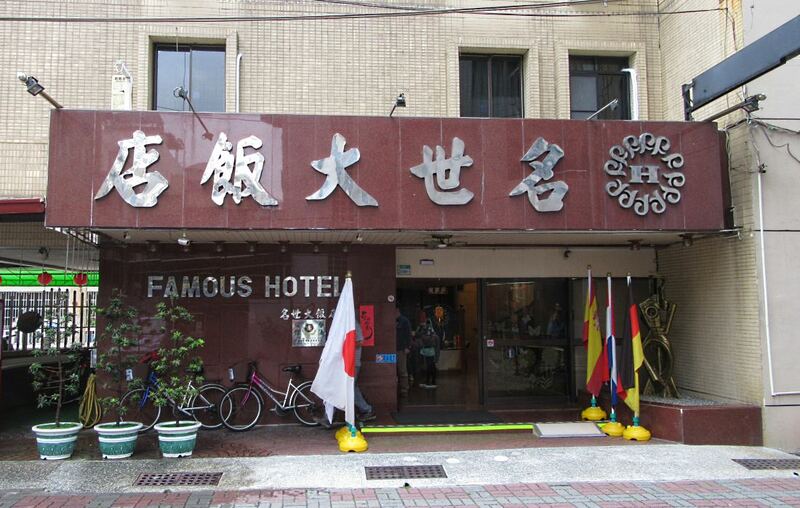 Hostels widespread in tourist areas, hotels (pic) and motels everywhere. Unless you're travelling at Chinese New Year, you can just book as you go a day in advance, or find somewhere in the evening. Police stations will help find you a room. We could always store our bikes securely overnight somewhere inside our accomm. Dangers and annoyances Some stretches of road have narrow shoulders and lots of fast traffic. On many roads there's a deep, unfenced, sheer-drop drainage ditch running parallel to you just a few feet away (pic). The Suhua Highway south of Suao is notorious, and has many narrow busy tunnels. Often cars and particularly scooters will pull out slowly from a side road into the road in front of you, carrying on regardless of your speed or progress. Wind and weather Prevailing winds in winter are from the north-east, and in summer south-west. It's mild in winter and can get very hot in summer – southern Taiwan is in the Tropic of Cancer. Winters in the centre and south are usually dry; in the north, or anywhere from spring to autumn, it can rain any time. 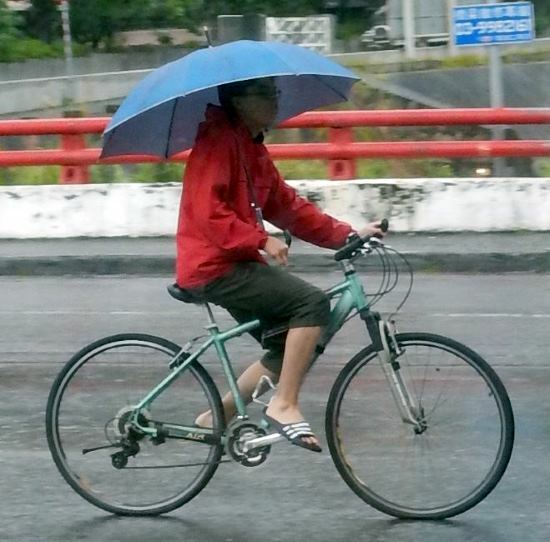 If a typhoon comes you won't be cycling that day. 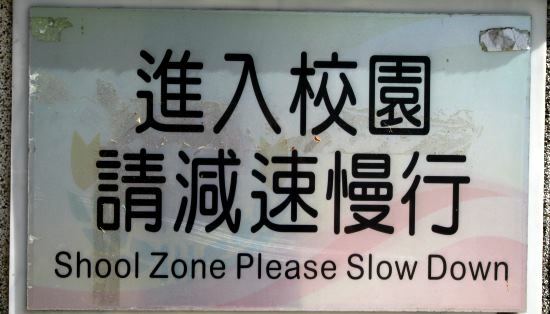 English On main roads, signs are all in Chinese and English. In towns and cities they'll always find someone who can speak at least a bit of English if you need help with directions, understanding a menu and so on. In remoter areas they might not speak a word, and your miming skills will be tested. 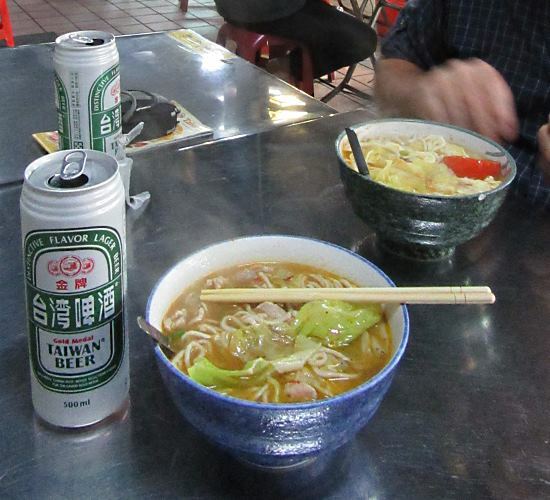 Typical costs Large can of local beer NTD50–60. Big bowl of pork and noodles from small eatery NTD50–80. Supermarket snack NTD25–60. 1hr train ride NTD80–200. Museum entry NTD50. Hostel bed NTD500, decent hotel room for two NTD800–1600 (but prices double in Chinese New Year). Manufactured goods (shampoo, bike inner tube, pair of shoes etc) same as at home.